1. All varieties of green and black tea made from the plant - Camellia Sinensis. 2. Tea should be stored in a cool and dark, dry place, preferably in a metal can or glass jar. Please do not store tea more than 365 days in order to prevent loss and damage of it`s flavor. 3. A cup of tea should contain half as much caffeine than a cup of coffee. You can remove about 80% of the caffeine if you`ll add hot boiling water to the tea, wait for 30 seconds, and will merge the liquid. Then you can add to your tea fresh portion of boiling water and brew for 5 minutes. 4. The "TEA" word in English and related languages ​​(tea) is the name of tea in the Chinese dialect of Amoy - Te (pronounced Tay). Cha - The word for tea in Mandarin, From it came the word - Chai, Char and other similar. Apparently, using a particular name for tea, depending on who supplied tea in particular country. Some countries use both names. 5. Often we read that tea drinking tradicion came from Chinese Emperor Shen Nung was almost 5000 years ago, which determined that the green tea leaves are thrown into the water, turning it into an invigorating, wonderful drink. However, we do not have the documentary evidence of these facts. The first mention of the use of tea belongs to the 4th century AD. Scientists thus believe that tea drinking began centuries ago in Asia. There, it was quite often used for medical purposes only, in the form of dried leaves, with the addition of mint, orange, onions, ginger. During Ming Dynasty (14-17 century) they began mix tea with boiling water. This, modern usage of tea leaves began less then 700 years ago. 6. Iced tea was invented only in 1904, when the exhibition in SAINT Louis was presented by Mark Richard Blechindena. Iced tea has become very popular around the globe, though before that iced tea drunk in America in the early 19th century. Interestingly, 80% of tea sold in the states as a chilled drink. 7. So, Who really invented the tea bag? Legend told us that the provider of New York, Thomas Sullivan found that costly delivery of tea in metal cans. So, in 1904 he began to sell tea in small paper bags. One customer accidentally dropped the bag into the water and found that it turns a good tea. History is beautiful, but the patent for tea bags is dated 1903. Most people who love tea believe that the invention of teabags actually worsened the taste and properties ot this amazing drink. 8. Until the end of 18th century in Europe people really believed that black and green tea are made from absolutely different plants - Chinese manufacturers hid their secrets very well. Tea plants began to be delivered from China alone at the beginning of the 19th century, along with the recipes on the production of tea. A little later the British found wild tea in India, he received the title of the Camellia sinensis. From this plant are made both green and black tea. The lowers and upper leaves are collected by hand. Plucked leaves are left to dry for extra day. The leaves are well rolled between special metal rollers to mix the flavors within the sheet for the best flavor. Break in the leaves are left in the open air for oxidation. "Oxidation" leaves are heated to stop further oxidation and to remove the remaining moisture. 10. You know the difference between black tea production from the green? 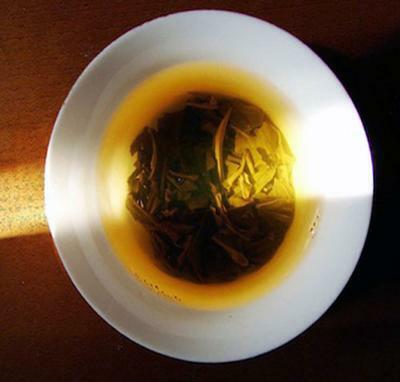 Green tea is steamed prior to oxidation to destroy enzymes. These enzymes in the oxidation of black tea change the color to black and add the appropriate "tea" taste. About 75% of the tea leaves in the world turn to black tea, the remaining 25% - in the green. 11. Some sorts of black and green tea are additional processing - for example, add oil of bergamot (citrus fruit inedible) in black tea makes it a sort of Earl Gray Tea. 12. Tea is grown mainly in 5 countries - China (almost 80% of green tea), Sri Lanka (often called Ceylon the birthplace of tea Lipton), India (mostly black tea), Japan (various exotic teas), and Taiwan (different varieties of green tea ). 13. Tea contains many antioxidants, with moderate consumption improves the immune system and helps in the prevention of cancer and cardiovascular disease.